locomente...: How I met my little brother…!! How I met my little brother…!! As I have already mentioned innumerous times, I am a single child and my yearning for a sibling has always been there within since the day I remember. 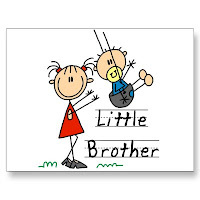 As I grew up, started to imagine an existence of an older brother and lived happily. But, only until I met him…. It was a time when I had cleared the intermediate examination of Chartered Accountancy. I then joined under a Chartered Accountant to do my training. This was a pre-requisite to be eligible to write the last and final exam. My best friend also accompanied me to the training. As a result, the scope of interacting with peers curtailed considerably. In spite of that, eventually, we started making new friends. Four months passed by. More people re-joined our office after giving their CA examination. Suddenly myself and my friend felt too alienated. They were all strangers; yet they knew so much more about the office and all others. I was feeling all alone and estranged, when I was plotted for a work. I was one among six. I was acquainted only with two of them and the rest were strangers to me. When we were divided into a team o two, I prayed desperately to be plotted with either of the two I knew. But, luck did not favor me. I was assigned in his team – a stranger to begin with and someone who showed too much attitude. He never used to mind me at office! I hated him. I felt so bad. I did not feel like going with him. But, were there any options at all? I had to be a part of the team. The assignment was to perform physical verification of fixed assets. Our senior divided the entire asset listing among the three teams containing two of us each. My arrogant partner took the asset listing in his custody and started walking rapidly to commence the work. I was running behind him. He was actually a little more than a year younger to me. But, he had started his training under Chartered Accountant almost two years before I did. Well… we can start our CA course after higher secondary or after college or rather any time for that matter. I started after my graduation and he started on completing higher secondary! I was scared because it was the first assignment for me. I think he sensed my fear. We started our work from their computer server room. He took charge of the situation and verified a few assets. Till then he had not even bothered to turn to my side. But, suddenly he did and said, “You understood na? This is how simple it is! You better do the rest on your own.” He then smiled and it spread warmth. I fell in love with him. I knew that my perception about him was wrong. Our work went on for a week. Eventually, we started to crack poor jokes and laugh uncontrollably. We used to finish our work very fast and go for a glass of some soft drink. By the end of it, we knew one thing…. This happened only four years ago. But, the bond we share now surpasses all those forgone years. In a way, life is full of surprises isn’t it? We end up loving those whom we hated initially. At times, we may start hating those who were once so dear to us. Life is such a huge baggage filled with oodles and oodles of surprises. It is our duty to wait patiently and always be ready for the bolt from the blue! This is the story of how I met my little brother…!! Cool , awsome.. Its better you be a writer rather than a chartered accountant. !